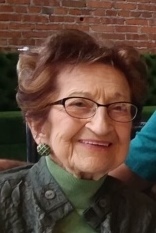 Lucille M. Churney, 98, of Streator passed away Tuesday, January 22, 2019 at Heritage Health Therapy and Senior Care, Streator. Mass of Christian Burial will be at 11:30 A.M. Thursday at St. Michael the Archangel Church, Streator. Msgr. Philip Halfacre will officiate. Visitation will be from 9-11 A.M. Thursday at the Solon-Telford Funeral Home, Streator. Burial will be in St. Stephen’s Cemetery, Streator. Pallbearers will be, Kyle Churney, Don McNamara, Don Derrington, Andy Churney, Bob Churney and Bruce Allen. Born August 31, 1920 in Streator she was the daughter of John and Emma (Lesak) Dzuryo. She married James J. Churney on June 3, 1941 at St. Stephen’s Church, Streator. He preceded her in death on January 9, 2001. She is survived by a daughter, Mary Lynne (Donald) Derrington of Knoxville, Tennsesse; a son, James (Sydney) Churney Jr., of Manteno; a grandson, Kyle Churney of Chicago; and sisters, Mary Anne McNamara of Dwight and Theresa McNamara of Dwight. She was preceded in death by her parents; husband; and a sister, Frances Allen. Born and raised in Streator she attended St. Stephen’s Grade School and graduated from Streator High School. She worked at the Seneca Shipyards during WWII. She later owned and operated Jimmie’s 12th St. Market along with her husband. She then worked for many years at Streator Home Building and Loan Association until her retirement. She was a member of the former St. Stephen’s Church and currently belonged to St. Michael the Archangel Church. She was active with the Streator Home Building and Loan retirees. She loved to garden through the years and also belonged to the Streator Garden Club.